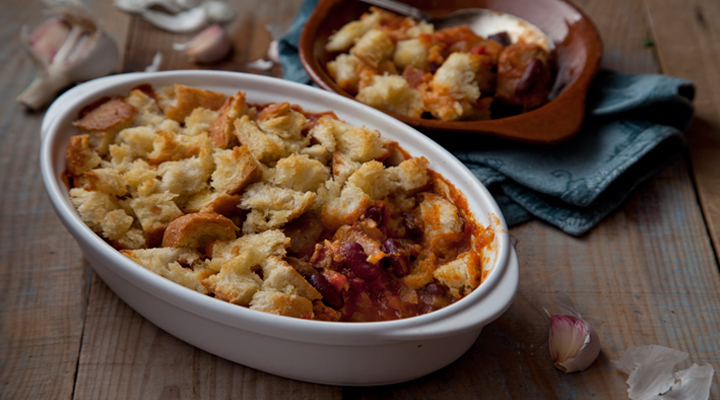 This recipe is great for using up leftovers, from roast lamb to stale bread. If using leftover cooked lamb, then skip the meat browning stage. Assemble in individual baking dishes if preferred. Heat 1 tablespoon of the oil in a wide ovenproof sauté pan or casserole dish over a high heat. Sear the lamb for 1 to 2 minutes, stirring regularly, until well sealed. Work in batches if necessary. Remove to a plate and keep warm. Heat the remaining tablespoon of oil in the pan, reduce the heat to medium and cook the onion for 3 to 4 minutes, until softened but not coloured. Add the garlic and cook for 1 minute before stirring in the flour and spices. Add the tomatoes and stock and bring to a simmer, stirring. Allow to bubble away for a few minutes, until thickened. Stir in the lamb, kidney beans and coriander and season to taste. This can be prepared to this stage up to a day in advance and kept covered in the fridge (or freeze the mixture for later use). In this case, bring back to a simmer on the hop before continuing. Tear the bread into small pieces and toss them in a large bowl with the melted butter. Scatter them evenly over the top of the meat mixture. Pop the pot pie in the oven to bake for 20 minutes, until the bread is crisp and golden. Remove and serve at once with steamed broccoli.